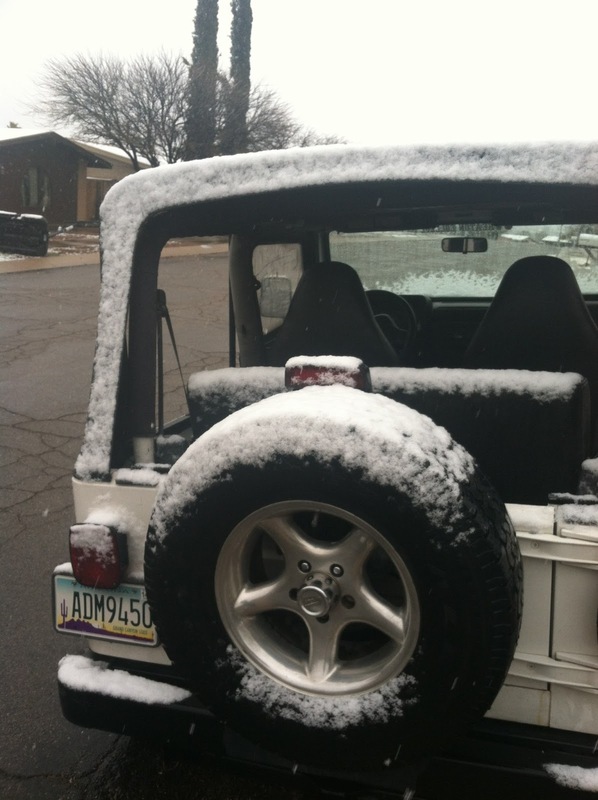 So it snowed today in Tucson. The Accenture Golf Match was postponed. Facebook lit up with pictures of every one's backyard. families were sledding down the hills at Lakeside Park by my house. My Jeep - open because it was 74 degrees the day before and also because - well this is S. Arizona - is now full of snow. My kids went down to the park and built a snowman. I remember making snowmen in Chicago and they would still be standing tall 2 months later. I expect the little snowman in our park has a very short life - perhaps a couple hours before Tucson returns to its usual warm and sunny self and our snowman is only a memory. How quickly our routines and lives are shaken up a bit (the snow surprise was fun) and how quickly - like snow in Tucson - it will all be forgotten. I have been thinking about contentment. I can be so deeply discontent and anxious - thoughts of the Lord are driven to the periphery of my mind and heart... then He steps in - as He always does - and accomplishes something wondrous and affirming and needful in my life - I shout out His praise, I give thanks - I "feel" content again .... then a week later or perhaps just a day - my memories of His provision and love and surprise - melt away and my discontent returns. Psalm 62:1 says "My soul waits in silence for God only..." God only ... that is enough! I can do without provision but I can't do without Him - and He is enough. Thomas Watson said, "It is not trouble that troubles, but discontent. It is not the water outside the ship, but the water which gets within the leak which drowns it. It is not outward affliction that can make the life of a Christian sad; a contented mind would sail above these waters." Contentment lies in Christ alone and He is always there.